Construction of Greek and Roman theaters as well as numerous temples required a lot of limestone blocks. Most of them were cut in the local quarry called Latomia (from Greek – “cut in the rock”), located on the side of the Temenite hill. Centuries of digging, cutting and removing stone created huge abyss with surprising shapes and left several artificial caves. 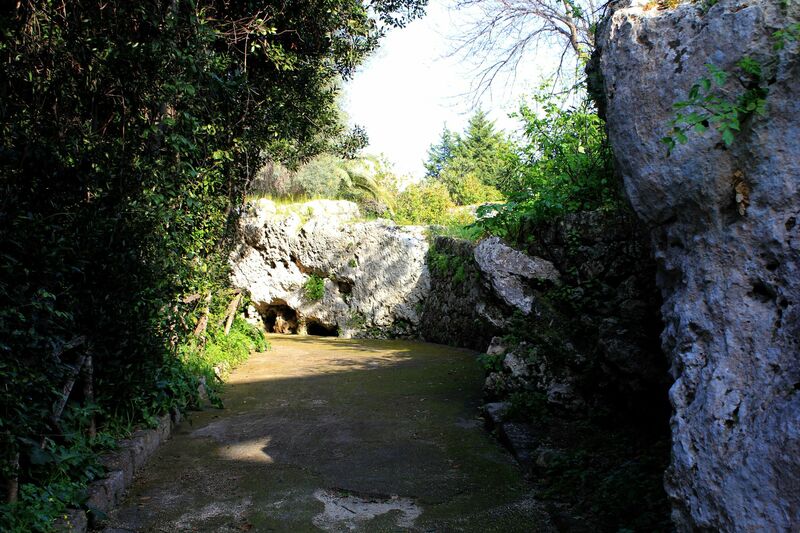 Today, the ancient quarry poetically called “Latomia del Paradiso” is one of attractions of the Archeological Park of Neapolis. 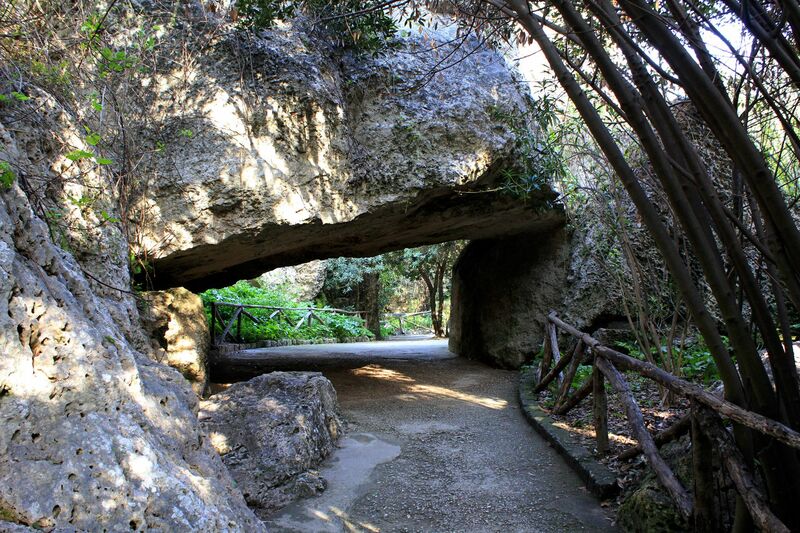 Indeed with its palms, orange and cedar trees, magnolias, lush vegetation and strange forms of rock formations shaped by human hands but also by the touch of Mother Nature, the Latomia seems to be like the place from the Another World – hence its name “Paradise”…. 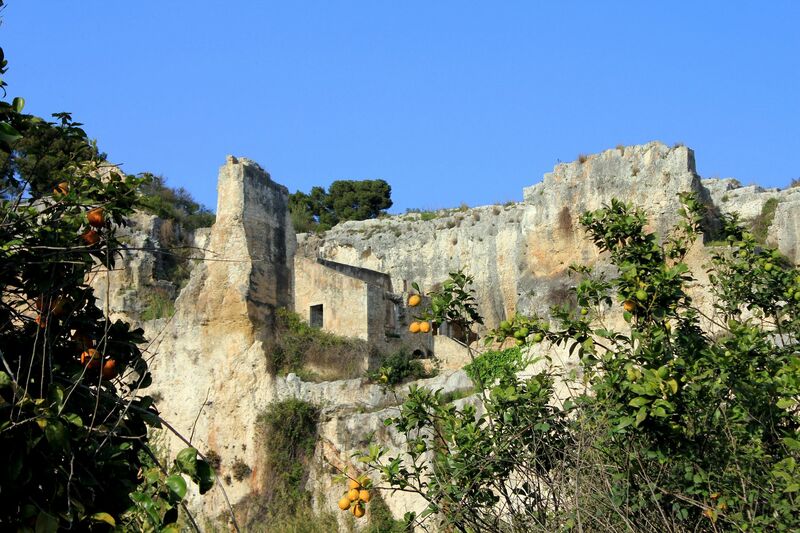 The largest and most intriguing cave in the Quarry of Paradise was nicknamed “Dionysus Ear” (Orecchio di Dionisio). 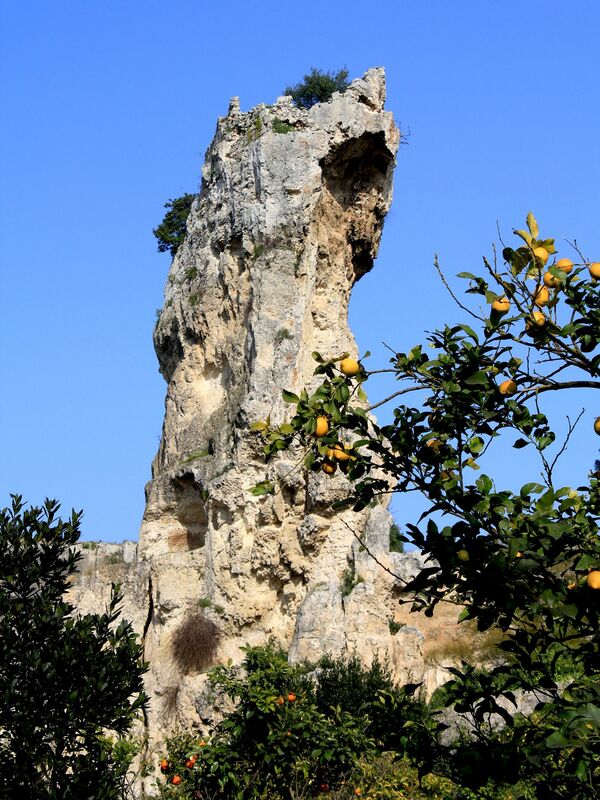 Its origins are not clear even today – some claim that it was carved in the rock for water storage by ancient Greeks. However its polished walls are pointing to some relentless “forces of nature” at the origin of the cave (for example a rainwater run-off shaping the walls for zillions of years in prehistoric times….). 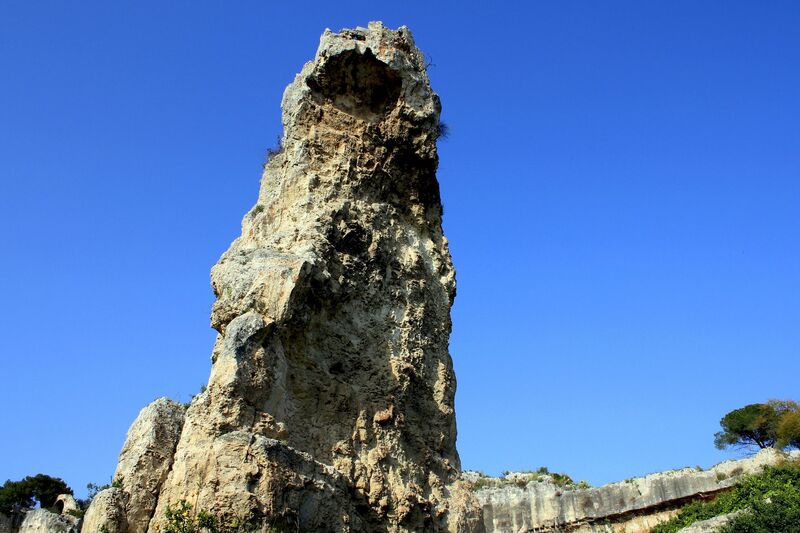 Whatever it was, the 75 feet (23 meters) high and 16.5 to 36 feet (5 to 11 meters) wide cave with its shape of human ear and excellent acoustics is one of the wonders feeding imagination not only of visitors but also historians. 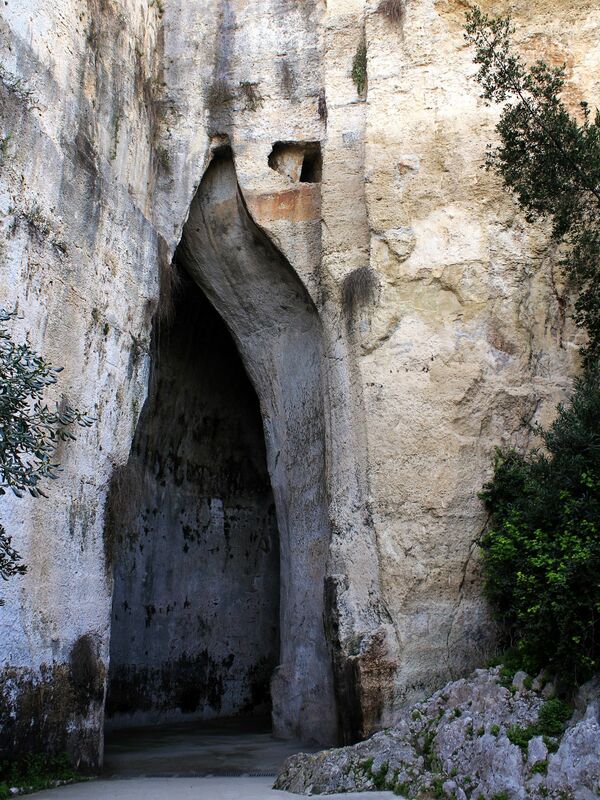 The name “Ear of Dionysus” was coined by famous Italian painter Caravaggio, stunned by its shape when visiting the site in 16th century. 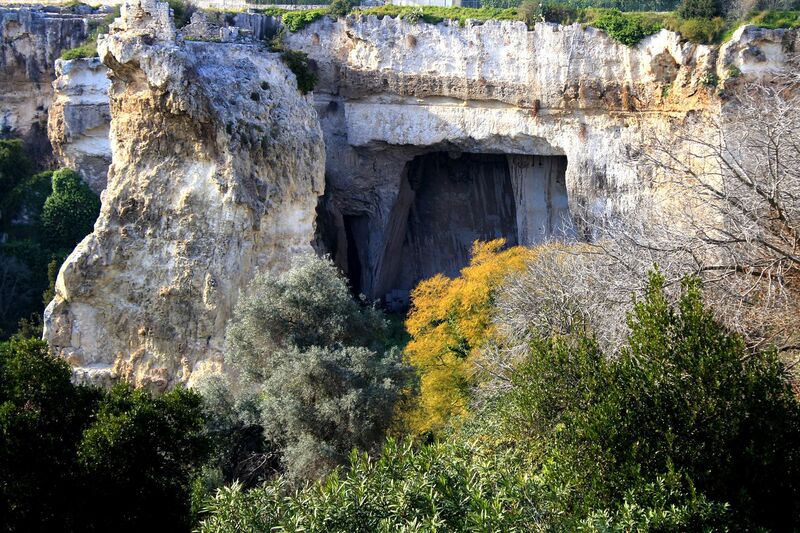 It makes reference to Dionysus the Elder – the brutal ruler of Syracuse in the 4th century BC (legend has it that cave was used as the prison for his enemies because thanks to its excellent acoustics he could listen to their conversations…). Rope Makers Cave is another notable cave in Latomia del Paradaiso. Its name refers to medieval craftsmen making all kinds of ropes at the site. The cave provided them the natural (and free) shelter protecting from baking sun or rain. The importance of their work is underlined by the nearby church consecrated to St. Nicholas of the Rope Makers! Unfortunately, due to the danger of collapsing, the cave is closed for public.